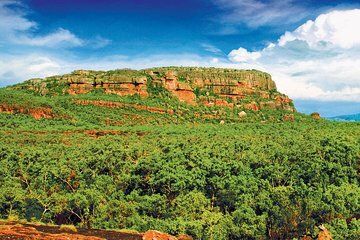 Experimente las maravillas naturales y el antiguo patrimonio cultural de Kakadu, el parque nacional más grande de Australia. 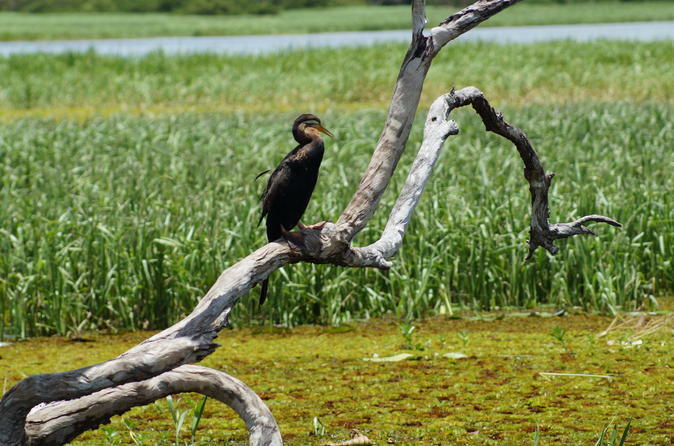 En esta excursión de un día completo desde Darwin, navega por el billabong de Yellow Water mientras observa a los cocodrilos que se deleitan en las orillas. Admira el arte aborigen antiguo en el "museo del desierto" de Nourlangie Rock y profundiza en la historia indígena en el Centro de aborígenes Warradjan. Visite el Centro de Aborígenes de Warradjan y conozca la historia de la zona. Cubriendo casi 20,000 millas cuadradas (32,180 km cuadrados) de ríos, humedales y antiguas mesitas de arenisca, el Parque Nacional Kakadu del Territorio del Norte es el parque más grande de Australia. Su aventura de un día completo en la naturaleza comienza con la recogida temprano por la mañana en su hotel de Darwin y aproximadamente a 2 horas en automóvil del parque. Cuando llegue, visite la extraordinaria colección de arte rupestre aborigen antiguo en el desierto en Nourlangie Rock. Recorra miles de años atrás en el tiempo mientras ve historias de la vida cotidiana representadas a través de pinturas rupestres bien conservadas. Descanse para disfrutar de un almuerzo al aire libre rodeado del espectacular paisaje del parque. Por la tarde, deslícese por el Yellow Water billabong en un crucero por el río. Conozca a la historia natural de los humedales con su guía mientras busca aves silvestres y cocodrilos que sobresalen de la superficie de la calma del agua. Finalmente, profundizar en la historia indígena del área con una visita al Centro Cultural Aborigen Warradjan. Al final de su aventura, relájese y empápese del paisaje en el viaje de regreso a Darwin, donde su viaje concluye con el regreso al hotel por la noche. The excursion was very good. The cruise along yellow waters is very beautiful. We could see some crocodiles, different birds and water plants. The guide was nice and explained everything very well. Although I would recommend staying a bit longer as one day excursion is a bit tiring because of long hours spent on bus. Michael is a great guide. He explained the site and stories of Darwin in details. The whole itinerary was running smoothly. Perhaps my visit was during wet season (no rain though), we had a comparatively small group which was perfect. A long journey but we'll worth it. Our driver was very knowledgeable and filled some of the journey with information. Be warned, as this tour states, it will be a 12 hour day and it was! Though it may not be totally known or understood, but Australia is about the same size as the US, so going from Darwin to Kakadu is like going from Washington state to the Dakota's. It is a very long distance to traverse, but our driver and bus were up for the challenge. The bus was very comfortable and our awesome driver brought much Aussie wit to keep us awake, present and informed on the journey. Our first stop was just for a break, but imagine seeing wallabee's just bouncing around your local gas station and you will understand the impact of this tour. Our personal favorite was the yellow water tour where we saw many amazing creatures and had a very large crocodile just swim along side the boat for several minutes. There is plenty to see and do and this tour encompasses many passions whether it is understanding the local's, see vast landscapes or animal encounters. The only warning would be about the northern territory flies. They are everywhere and love being in you face, so if you have a chance to purchase a face net, I highly recommend it. True this may not be the fashion look you are going for, but swatting at flies as they creep into your eyes, ears, nose etc, may encourage you to look a little goofy for a few hours. The history and cultural aspects of Nourlangie Rock is aspiring knowledge for all Australians. Rock art depicts many stories. Excellent day out. Would strongly recommend paying the 250 AUD each to do the scenic flight, absolutely stunning! Driver/guide, Dave, very informative and friendly. Yellow river cruise was brilliant and we even saw a crocodile! Long day but well worth it. Disappointed. Spent whole day in a bus and saw nothing. The only good thing was the Yellow Water tour. The rest was wasting time and driving around. Finally, we’ve spent 20 min at Nourlangie, didn’t even get the chance to walk to the lookout. In short, won’t see much of Kakadu.